Army is a huge trend for fall and it never seems to go out of style, it just keeps getting updated each season. 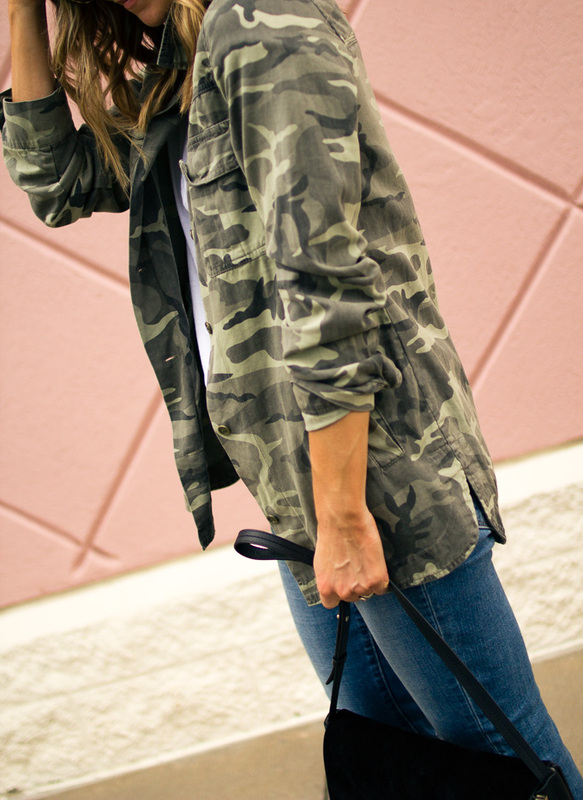 If you’re not sure you can pull off the camo look, I am sharing a few ways you can easily incorporate into your wardrobe. *A camouflage print t-shirt, jacket, or jeans are all excellent ways to start building your casual camouflage look. Pair with you favorite pair of jeans and sneakers and you got yourself an easy, chic casual look. *Adding a dose of camouflage print to your look can be as simple as donning a few accessories. A camouflage print clutch would be a fun addition, as well as things like watches and scarves. *Try teaming an ultra girly dress and heels with a camouflage print utility jacket for something a bit unexpected. * Not digging the camo print. Try adding a camo green piece to your closet. This camo green dress is stunning! Love those Levi’s. I have never owned a pair. Are they true to size? Yes, they run true to size! A current favorite of mine!